From robot dessert tables to robot favors, to robot cakes and cupcakes, enjoy a round-up of 30 of some of the best robot party ideas and supplies online. You will not want to miss out on this Free Printable Robot Birthday Card. If your child is a fan of Robots, they will love building this Robot Bank. Sit back, grab some robot fuel, and enjoy. What makes this robot birthday dessert table from Little Big Company so great? It’s the perfect combination of simplicity and a high level of detail. These robot party desserts are seriously some of the best I’ve ever seen. From the super talented Blue Cupcake, you have to check out these cake pops as well as the matching cupcakes, cake and rice crispy treats. How great is this robot birthday party from The Couture Cakery? The red and blue really pop and set it apart from other parties with the same theme. Color (but with huge hits of white) also plays a big role in this adorable robot-themed party. It was thrown by Mulberry Paperie for her son’s second birthday party – and deservingly received a feature on Hostess with the Mostess. I consider this to be the mother of all robot parties. Three years ago, when I was looking for robot party ideas for my own son’s first birthday, this party by Hostess with the Mostess was literally the only cute party I could find. I think its little DIY robot centerpiece still sets the gold standard for adorable robots. If the previous party was the mother of all robot parties, then I guess this is the baby. Hostess with the Mostess recently created this robot themed baby shower and it’s beyond adorable. This robot party is so sweet. And that cake!!! Bunnycakes helped plan it for her nephew’s first birthday. The inspiration for the colors (orange and blue) and theme was an incredible robot quilt his mom sewed. I would love to attend a party where popcorn was available in these robot popcorn bags. This heightened level of adorable was served up by Melbourne Epicure. Speaking of robot cakes, this one from Ciao Annie is beyond awesome. Created for her son’s first birthday party, it has real working lights. ‘Nuff said. Jane of Short and Sweet threw this robot-themed birthday party for her son and nephew – and a staggering 100 guests! She made everything herself -the decor, the signs, the labels, the favor boxes, and that cute robot cake. There’s no end to the party inspiration that can be found on Kara’s Party Ideas and that’s where I first found this robot-themed birthday party. It was styled by A to Zebra Celebrations. In a round-up of 30 robot parties, we couldn’t leave our own off the list, now could we? To promote our Robot Rules Collection, we styled this “Make Your Own Robot” dessert table. This build your own robot card from The Celebration Shop is nothing short of genius. It was created as part of a fabulous robot-themed 7th birthday party. From My Insanity, this robot design academy party was thrown for her six year old son. This party has the most adorable 3D robot party invitation ever. These DIY robot favors have to be some of the best I’ve seen for a robot party. Little Bit Funky made them out of a slinky, box tick tacs, chocolates and crayons for her son’s third birthday party. This robot party was a labor of love for Etincelle Creative Studio. From the dessert table to the handmade favors, her client was thrilled with the results. The characters created by Kat’s Cakes for this robot birthday party could not be any more perfect. The colors highlight the gears and matching food. And how about these robot characters? LOL! Love those robot costumes. There is so much awesomeness happening at this little boy’s robot-themed birthday – and Creative Vision captured it all! Talk about a tight budget! Buttercream Bling created robot birthday party was done as part of our Boy Bash on a Budget Challenge. Isn’t the DIY robot at the center of the dessert table the cutest? As a party supply company, the greatest thrill is seeing a customer take your work and make it sing. We’re sure that’s how A Blissful Nest must have felt after seeing this customer’s party. 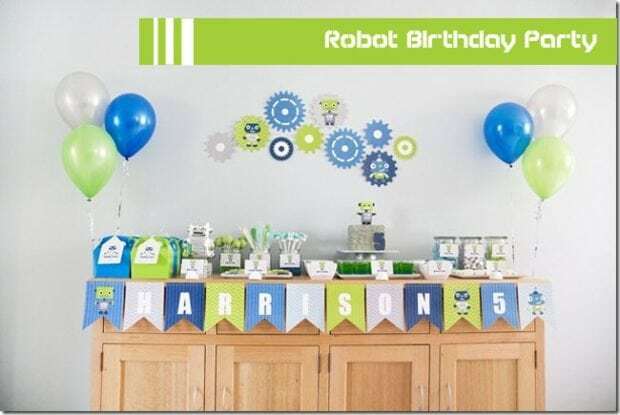 And using the same printable collection her customer used in the previous party, here’s how A Blissful Nest styled her own son’s robot-themed second birthday. Domestic Charm threw this robot party to celebrate her son’s fourth birthday. The themed activities were fun for kids and parents alike – including the DIY robot bodies for the kids and adults to dress up in. 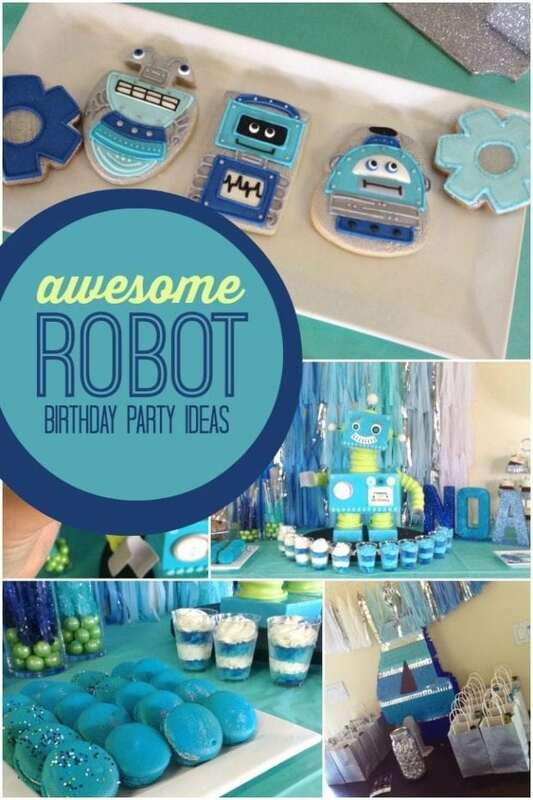 Candace of Lily Paul Designs threw this robot party in honor of her son’s first birthday. She included so many fabulous details – I’m loving the build a bot activity she had for the kids. This eclectic robot-themed party from Kinderplays is chock full of ideas. And I love the light blue, red and yellow color palette. Perfect for a boy’s birthday party. The use of repetition on this robot-themed party tablescape is what sets it apart. It was planned by Pretty Pink Tulips for her son’s 6th birthday. The photography alone is reason enough to take a peek at this robot-themed birthday party. But it’s the ideas that Proud Monkey Photography incorporates into her son’s fourth birthday party make it worth the visit. Could there ever be a better combination than robots and rockets? Maybe peanut butter and jelly. Maybe. 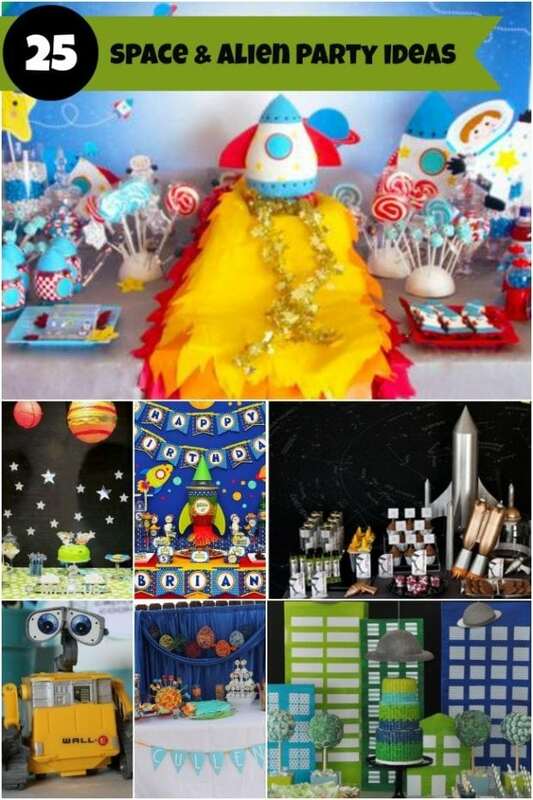 I love the ideas used in this robots and rockets party for a two year old boy, which was planned by Sunshine Parties. I cannot get enough of the robot cookie pops that were part of this robot themed party Ma’ Cake and by featured on Sweet Designs by Amy Atlas. I know a lot of boys who would like a retro robot-themed birthday. And even a few husbands too. LOL! This colorful version was created by Love Paper Paint for her son’s third birthday. The invitations are a definite must-see. Looking for robot party supplies? Here are some of our favorites! Check out more great robot themed party ideas.